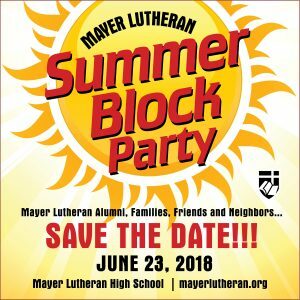 Don’t miss the 2017 Summer Block Party at Mayer Lutheran High School! Participants can register at the event, too! This event is open to alumni, current MLHS families, friends and community so come and enjoy the day! Questions? Email susan.parrish@mayerlutheran.org or call 612-749-4578. Interested in helping in any of the following areas? Email susan.parrish@mayerlutheran.org to volunteer. Thank you!